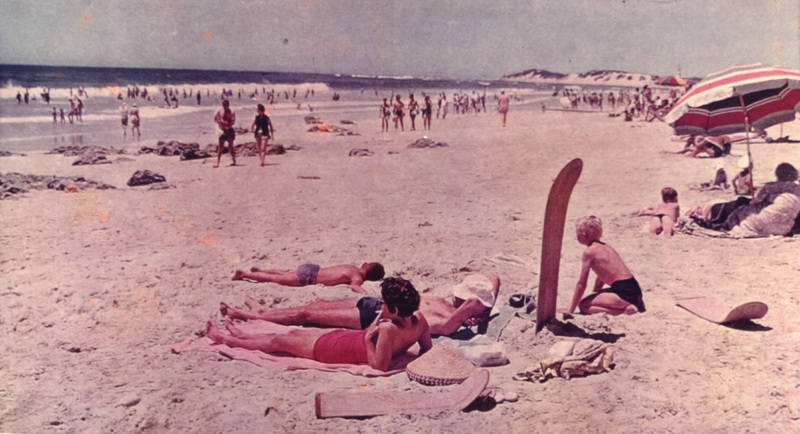 Back in the late '50's King's Beach and Summerstrand Lifesaving Clubs came into being. 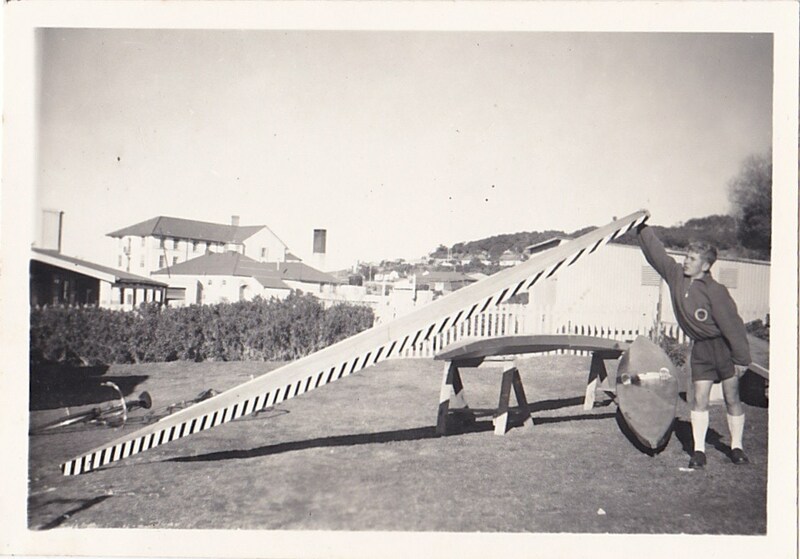 Part of the equipment that the guys used included things called Crocker Ski's. 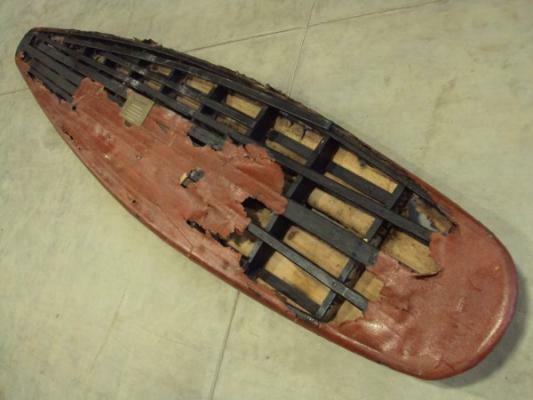 They were 9ft6 long flat boards that you stood on and paddled with a long 2 bladed paddle. Kinda like a SUP pretty much, but with a double paddle. They were hollow, and had plugs you could open to drain the water out of. 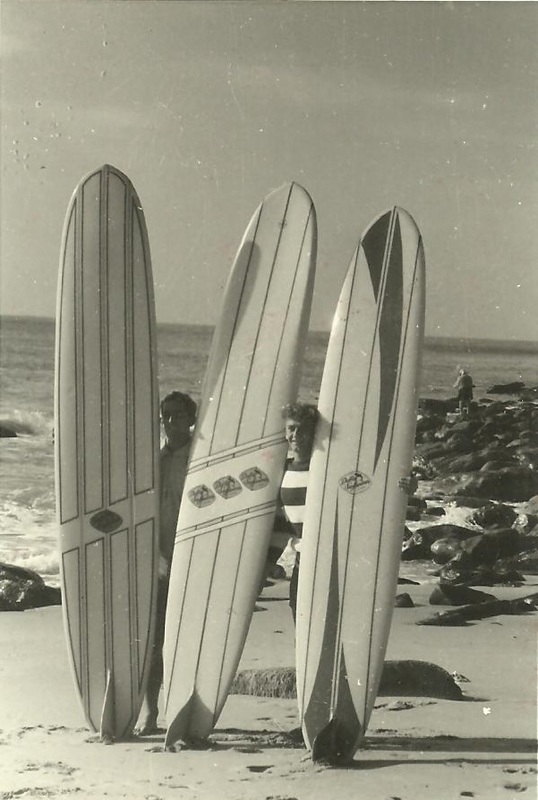 Soon after the Crocker Ski came the Hawaiian boards - long plywood boards built for racing. The guys would knee paddle them around marker bouys and back, but also worked out they could be stood on and surfed fairly effectively. The boards were big and heavy and ideally suited to going straight, so much of the surf riding took place in front of the lifesaving clubs as the boards were too heavy to carry anywhere else. As Pollock beach picked up way more swell than King's Beach, the KB crew used to paddle their boards the 2k's up to Pollock for a surf, and then paddle back afterwards. 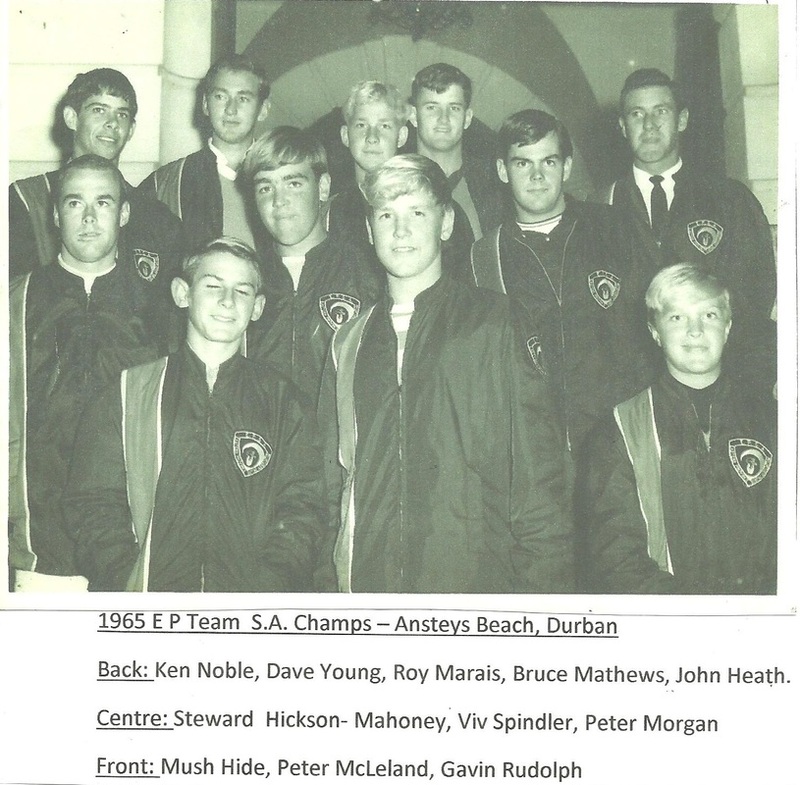 Kings Beach lifesavers Bruce Matthew and Neil Stuart (Sluggo) were the first guys to make a proper foam surfboard in PE. 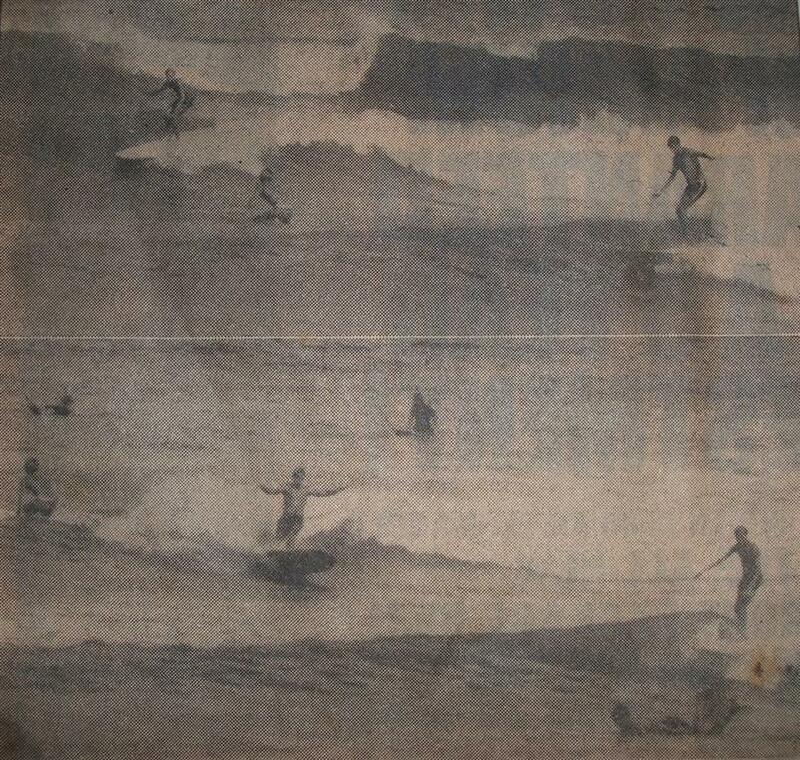 Back in 1962 they got a design for a board from a Hawaiian surfing book and ended up making a 9ft6 in Sluggo's garage in 6th avenue, Summerstrand. Bruce worked at Bostik, so knew a little bit about glass fibre, resins and glues, so they decided to use styrofoam instead of balsa wood for the board. They took blocks of styrofoam and glued them to a big meranti stringer, got some 10 ounce fibreglass cloth from the Carbon Black factory - where it'd been used as a dust filter - and was filthy black and had to be washed out in the sea before they could use it. They glassed it with epoxy resin, and then painted it with some gloss paint. It weighed considerably less than the heavy wooden boards and opened up a whole new world of opportunities to the guys. 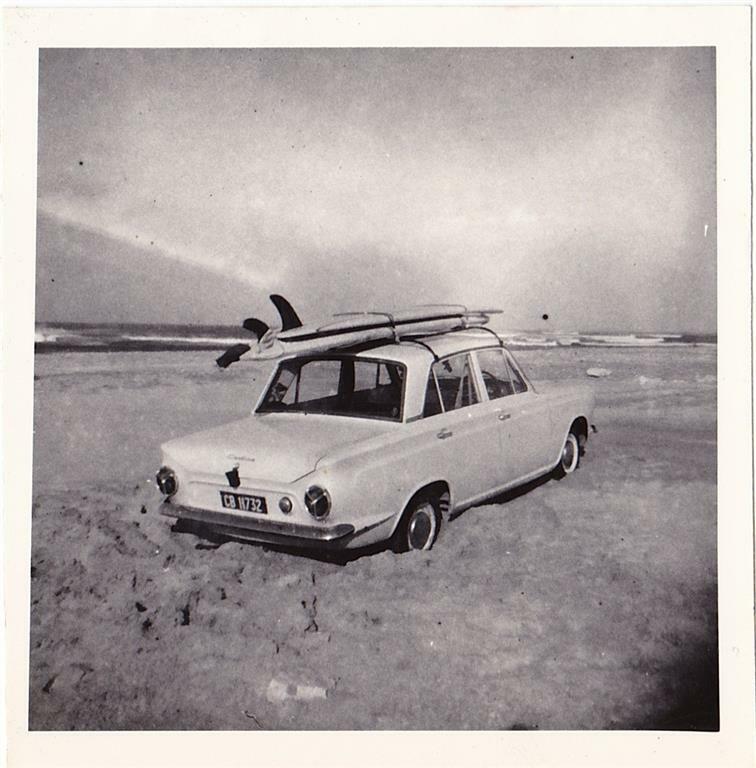 In 1963 Bruce heard of fibreglass boards being made in Durban, so he and Frank Giraudeaux decided to try building a polyurethane foam board. 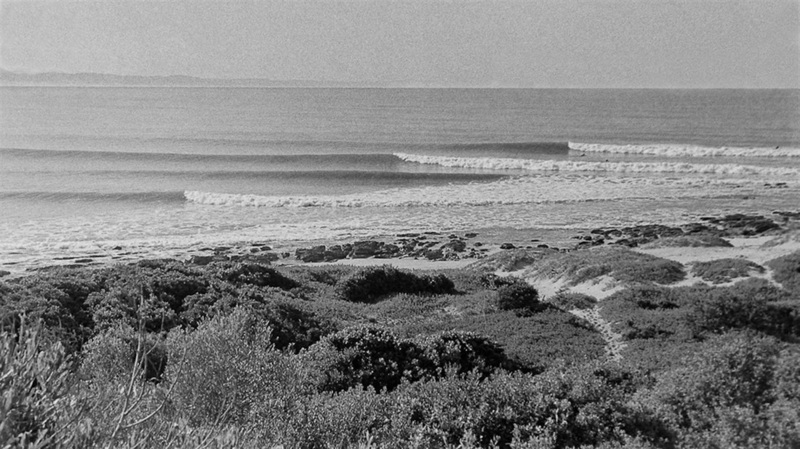 They'd heard of John Whitmore in Cape Town who was building them using imported blanks from Clark Foam in the States, so they ordered a blank from him. They hadn't really intended to go into it commercially, but everyone was frothing on their boards and wanted one so the orders started flowing. 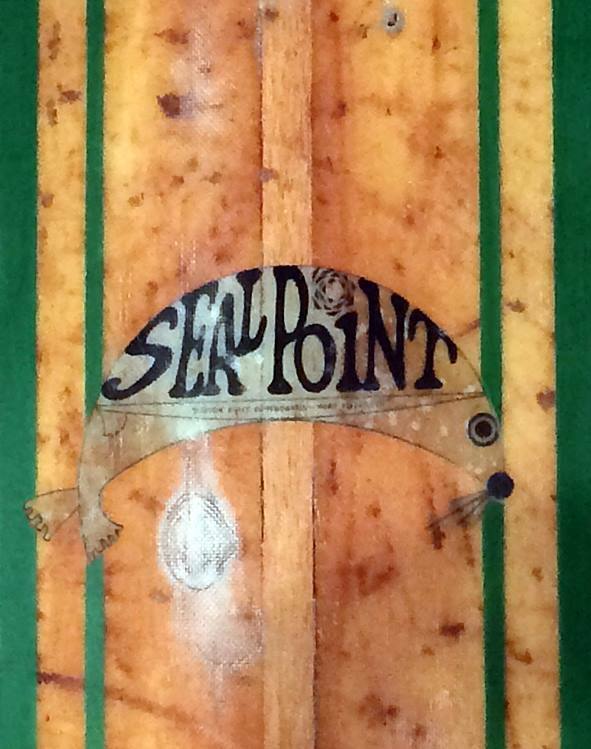 They called themselves Seal Point Surfboards, after starting out in Bruce's garage, set themselves up in a little warehouse off Russell Road. Bruce recalls being nearly finished with his 3rd board when Gavin Rudolph's dad came in and said his son Gavin - then about 8 years old - was completely smitten with the surfing bug and he wanted to buy a board for him. So Bruce had to hack down the 9ft'r to about a 6ft7 grom size model for Gav. 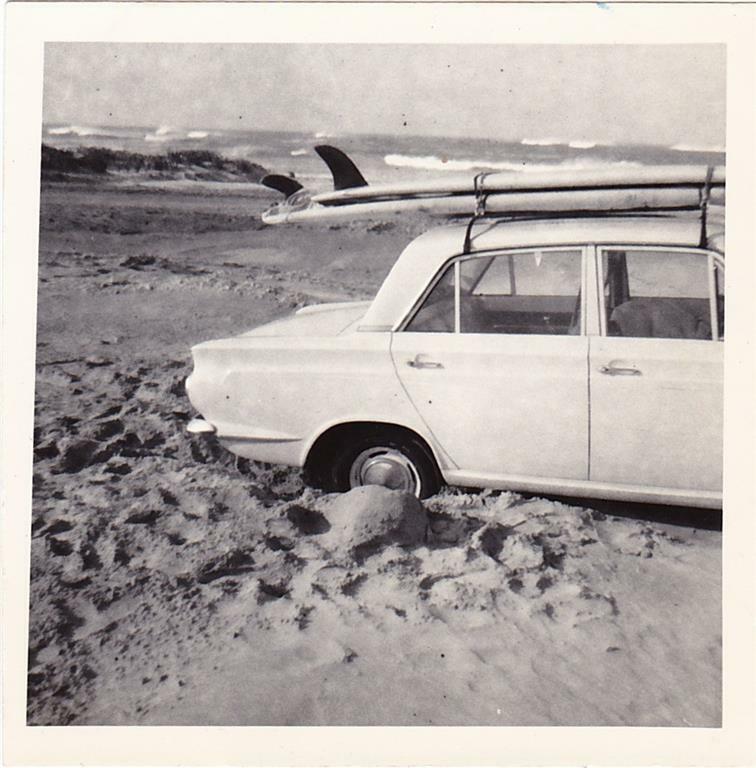 Pretty much anyone surfing in PE at the time was on a Seal Point surfboard, unless they'd bought boards in from John Wittmore in CT or Max Wetteland in Durbs. By 1964 they'd made about 100 boards. The most expensive one's, with nose and tail blocks and some colour, retailed at about R100-R115. That was pricey for back then - considering a 3 course meal for 4 at the then-swishy Bell restaurant at the Beach Hotel set you back about R15 in total, including drinks! Using a "back in the day" version of the Big Mac index, a burger was about 25c - so a board equated to 450 burgers! The guys then started a cheaper line of boards called Swift, for which they used locally made foam, not the imported Clark Foam. These borads were about R75. At about the same time Martin Toms also started building fibreglass surfboards, under the Dolphin Surfboard label in a garage up in Western Rd. The lighter more maneuverable boards meant the guys could start surfing new spots - like Fence - which involved a long walk down the beach. 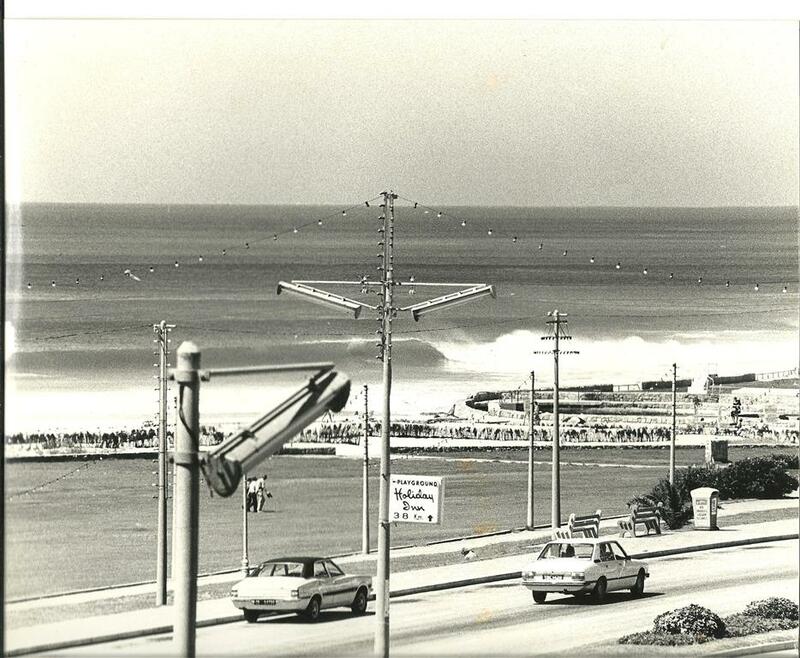 In 1965, the take-off spot was round about where the tank farm is today - about 300m further up the harbour wall than where the guys surf today. Dave Ward, a KB lifesaver from way back, tells the story that when his dad Tom was a young boy he remembered the waves at King's Beach on a spring high tide sending spray over the railway tracks just below Beach Rd! Another popular spots was Denvilles. Named by KB lifesavers Neville Mandy and Dennis Buchman who were the first to surf it and hence got naming rights. 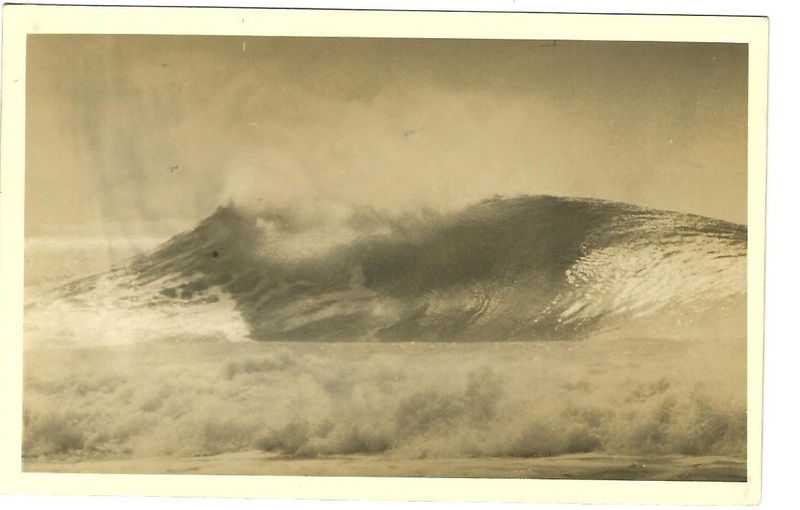 In those days it was a semi-rocky right point, throwing out decent barrels on good swells. There was also a right which broke off the other side of McArthur Pool down onto King's Beach, as the beach was much narrower back then. Pipe at Pollock Beach became popular as back in those days as there was plenty sand on the beach and the wave's were better than they were today. 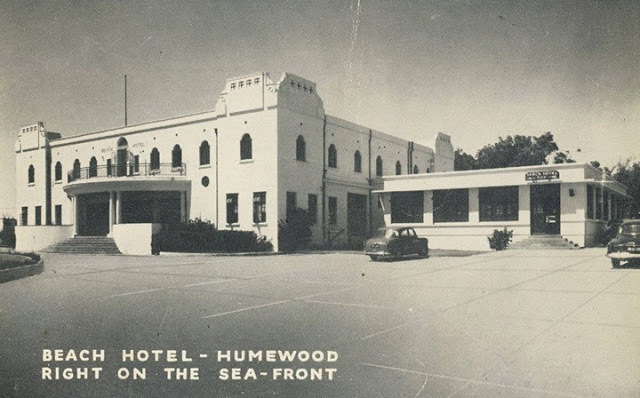 The only development in that area in the early days was the lifesaving club and the hotel. The rest of the area was covered in Port Jackson, which did a good job of stabilising the dunes and keeping the beach in tact. Rob Connacher, one of the first Summerstrand lifesavers recalls that on a really good day there'd only be about 10 guys in the water. The Nicol's brothers and Wally & Rowan Haynes were among the early crew there. 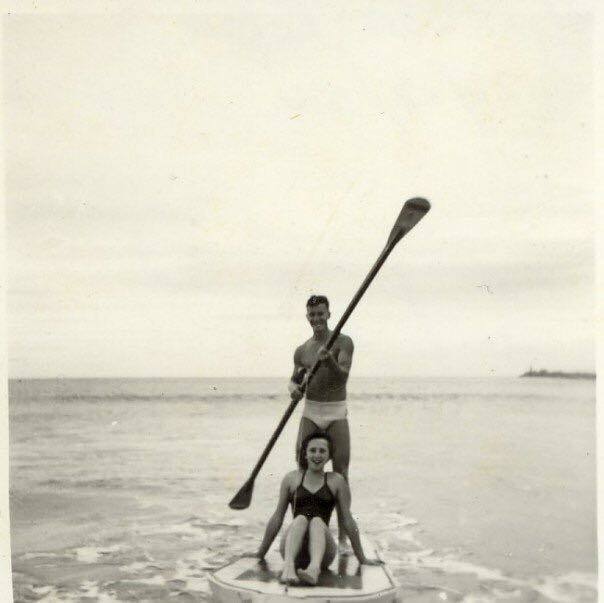 Rob got his first surfboard in 1958 - a 12ft'r from Australia. 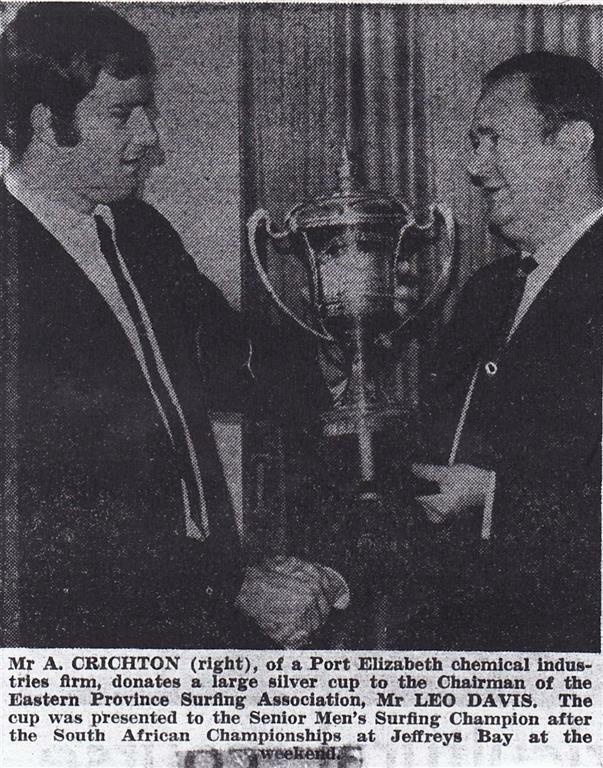 Sandy McGillivray - who started King's Beach Lifesaving Club (and had also been deputy-mayor of PE!) opened the first surf shop in town - called - The Surf Shop! It was in Brittania Street, situated just off Main Street (Govan Mbeki) near the town hall. He stocked Seal Point surfboards and a range of cossies, towels and other beach gear. Later on the shop moved from town to the Elizabeth Hotel (nowadays the Garden Court Hotel behind McDonalds). Surfing grew quickly now that boards were readily available, and the guys started to explore the surrounding area's. 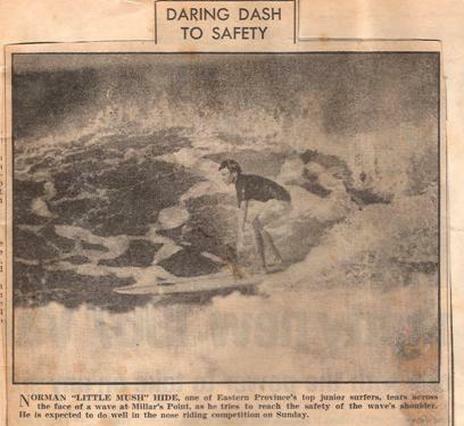 Members of both lifesaving clubs were amongst the first surfers at Cape St Francis, JBay, Plett and Buffalo Bay. 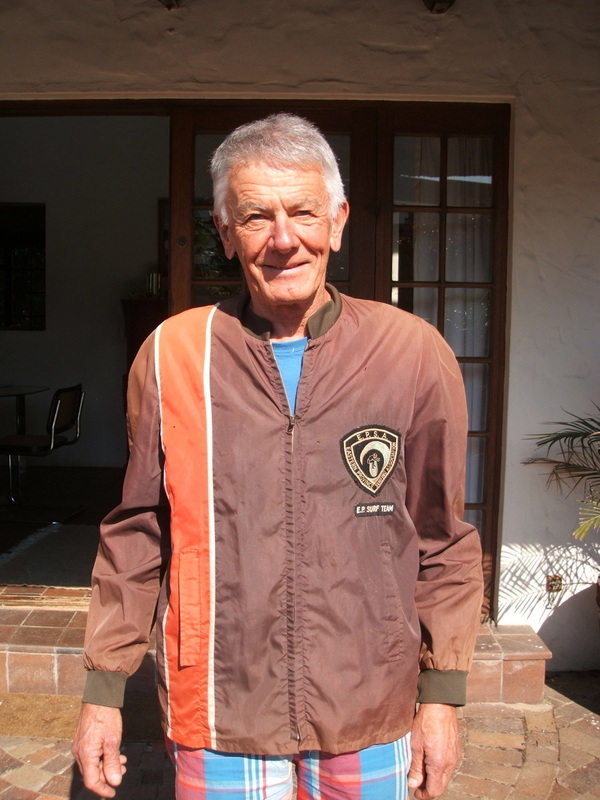 They'd heard about JBay/SF from John Whitmore when he'd driven down the coast from Cape Town en route to Durban. Weekend missions out to JBay quickly became the norm. Although you had to get a crew together to take with you, as you'd only be in the water with those that you arrived with. In those days JBay was still a farm, and you had to pay the farmer, Meneer Malan, a small fee to get access. The ou's camped in the bush's at the Point. 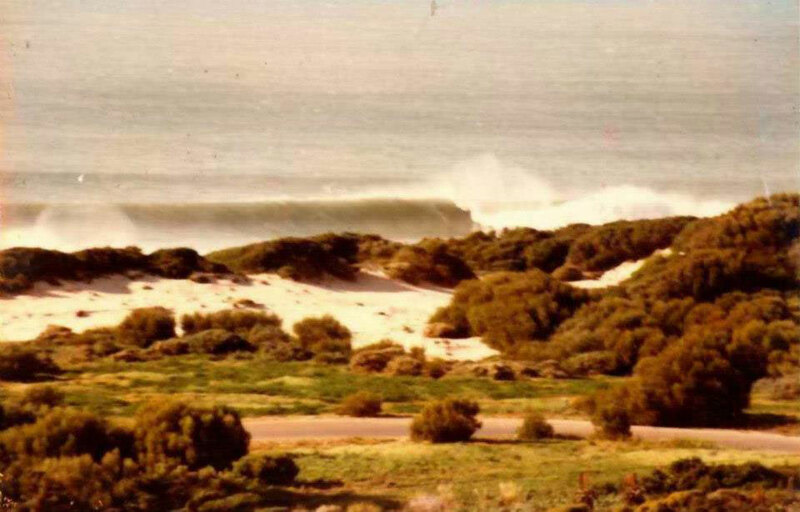 No-one tried to head up to Supers, for at the time the Point was the perfect wave for the equipment they had - no leashes back in those days! Trips to St Francis also became common place, although in those days it was a mission to get there as you had to go round the back via the Oyster Bay road. There was just the hotel on the beach in SF and the odd house, and nothing much at Seals. 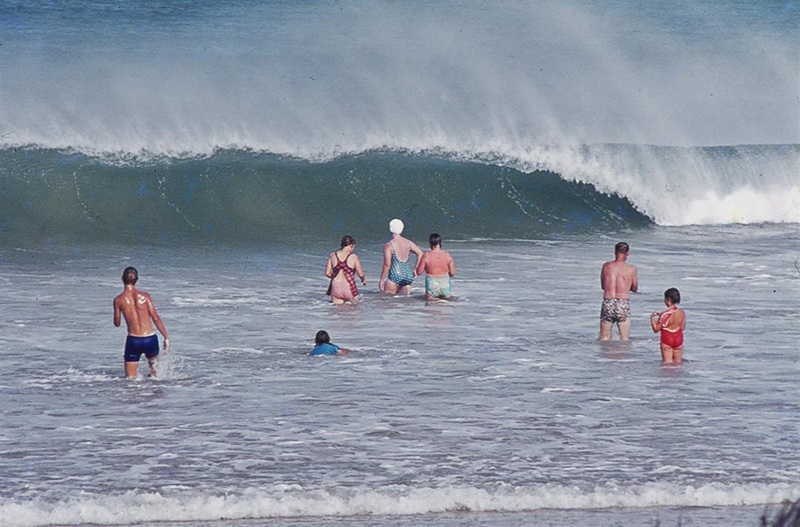 The lifesaver/surfers continued to pioneer new spots around town as well, and Cape Recife became a popular haunt. Although in those days there were no leashes, and the swim back in to fetch your board was a long one - and the guys often spotted sharks on the way back in, making them a bit nervous! ​The very outside point at the tip of the headland was known as the best wave, although not surfed often cos it was so far out. Getting to Cape Recife was a challenge as there were large swathes of sand that you had to try drive through, and more often than not get stuck in! 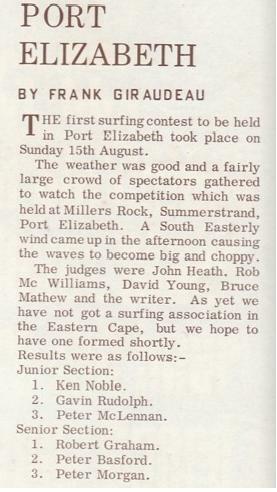 Given the competitive nature of the lifesaver surfers, Bruce, Frank, Martin, Leon Killian and John Heath created the EP Surfing Association in 1965 and started having some comps, although the first ever surf comp in PE was held the year before at Millers in 1964. After shaping for 2 years, Bruce handed over the reins of Seal Point Surfboards to a visiting Pommie beachbum (who's name he can't recall) and he took over shaping the boards, whilst Bruce went on to work at VW. Leon Killian remembers the Pommie guy being a red-bearded dude called Mike - who'd arrived in PE from the UK with not a cent to his name. In order to feed himself, he would stand on the breakwater at Fence with a boulder, waiting til a school of mullet swam by - and then drop the boulder onto them. They few he managed to stun or squash by doing that he'd then go cook up on the beach! ​Mike was a belly boarder, and after dropping in on Leon 3x in a row at Fence, Leon warned him not to do it again. Which he promptly did. Retribution was swift - and memorable. After his sesh, Leon was back in the clubhouse and saw that one of the guys had just finished sanding down a new surfboard - so he took a handful of the glassfibre shaving and stuck them into Mike's underpants - apparently he scratched for months after that. But no doubt never dropped in again! Mike then met a girl who told him that in her fathers will it said if she got married she'd get R600 - so they promptly decided to get married to get the cash, and then divorce afterwards. They spent the cash on buying a Kombi and went on a surfari up to Durban, and turns out 4 years later they were still married! In my efforts to track down some old Seal Point boards I found one hanging up at Surf Centre - but the shaper was Charl du Plessis. How did he fit in? Turns out he's Brian du Plessis's dad - Brian being a fellow Miller's Local - so grabbed his pop's number and gave him a ring. Charl takes up the story - "I took over from the Pommie guy - I was just hanging around the shop helping with the glassing, and asked Sandy to let me have a go at shaping. He did - and next thing I knew I was shaping Seal Point surfboards. Must have done over a 100 in my year or so there. Gary Morgan, an American guy, joined me for a while. He was ducking the draft for the Vietnam War and his gran had bought him this round the world ticket and somehow he ended up in PE - and got involved with us shaping boards!" Charl recalls how good Fence used to be - describing it as being like dropping down into this void, and just praying your fins held! 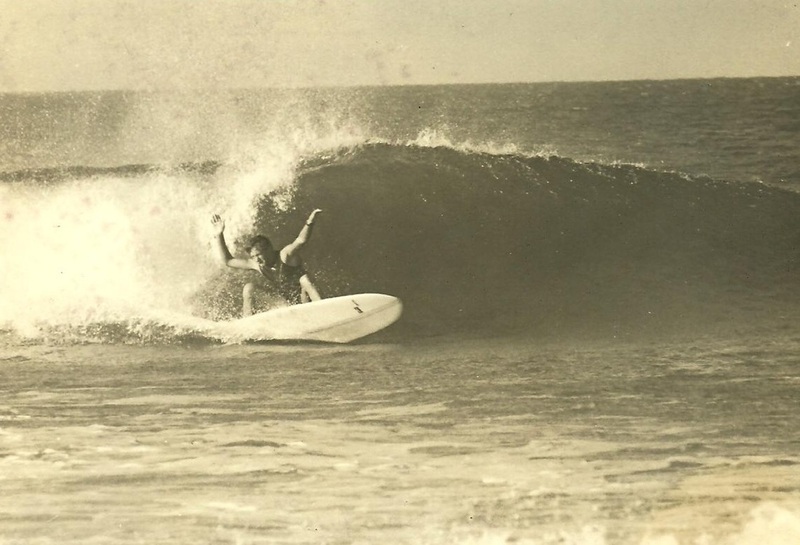 In those days there were no leashes or wetties, which contributed to keeping guys at the beachbreaks vs the reefs/points. He also remembers how good Denville's used to be - comparing it to to the difference between Point and Tubes in Jbay - with Denville's being Tubes and Millers being the Point. There were stories of Humewood breaking out beyond the last pylon on big days, and the guys had to duck under the ropes that stretched from the pylon to the light on the opposite pier. Charl was also one of the first guys to surf Supers, together with Max Wetteland, Ant van den Heuvel and Loopy Cerff in about 1967/8. Max had been eyeing it out for ages, and made a special lightweight board specifically to ride out there. Jonty Hansford's name popped up, as the "Magic Seaweed" of the time - turns out Jonts kept a detailed record of the weather/wind/waves on a daily basis and honed his forecasting skills to the point that he'd just be able to look up at the clouds and tell the guys when the surf was coming! 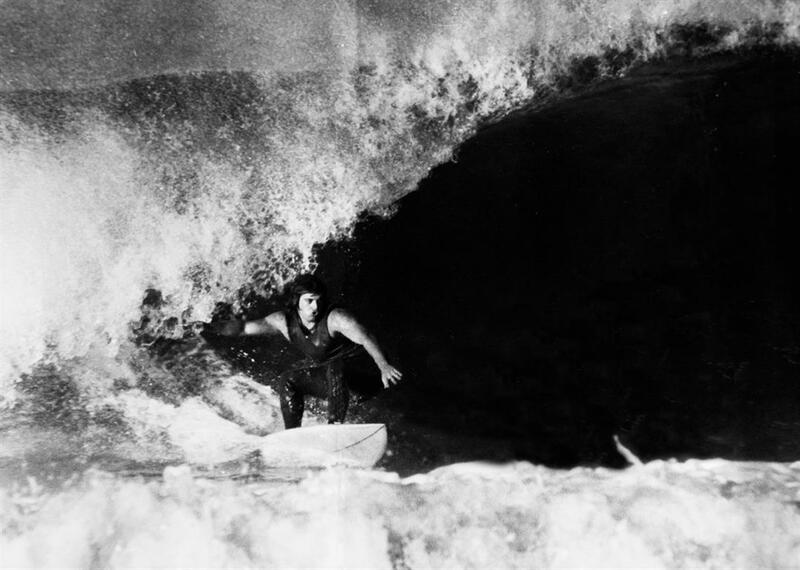 Leo Davis was another of the guy's involved in the original PE surf scene. 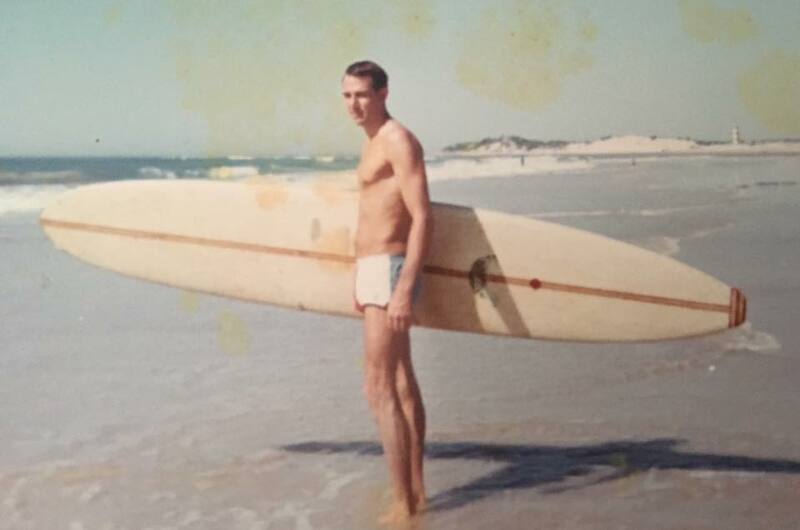 He was the Chairman of EP Surfing from 1965 - 1971. He remembers the first EP tracksuits as being orange and brown - as the supplier didn't have any black and red in stock and decided orange and brown was the next closest thing! In those days surfing was even more of a fringe sport than it is today, so in order to lend itself some credibility the guys realised they needed to have a well-known and respected President. So Sandy McGillivray became the first EP Surfing president - as he was a Councillor, as well as a big shot in SA Lifesaving. Leo recalls one of the first sponsors who donated EP a big trophy to award to the men's champ, and when meeting him in his office for a pic with the trophy for the Herald - the guy looked at him and said "Stand here and try look intelligent!" Herald Newspaper clipping - with Leo being told to "look intelligent!" Leo recalls the first place to offer off-the-shelf boards was Crestrider Canopies down in the Baakens Valley. They made only 1 type of board - a 9ft6 that was green with a single fin. Not even a label on it. They sold for about R70 bucks. They then decided to build another much bigger model, but these didn't prove to be popular, and next thing the factory burnt down, and that was the end of PE's pop-put boards. 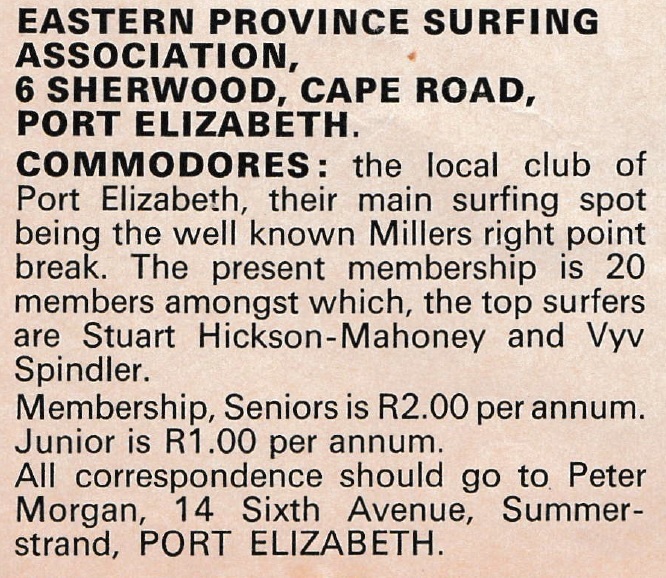 The idea behind the Commodores - the first surf club in town (started by Leo, Peter Morgan & Barry Hastings), was that with only 1 or 2 EP trials a year there wasn't enough competition for the guys to prepare for SA's. There were about 40 or so surfers in town at the time, so the plan was to divide them up into 2 halves, with a mix of Fence and Pipe guys in each, and form 2 clubs that would then be able to hold regular comps against each other. In typical surfer fashion, only Leo's Commodores got off the ground, and no-one ever took the initiative to sort out the other club! No-one's sure where the name Commodores came from, other than it was decided upon after a few beers, and it had something to do with the sea! The Commodores started in about 1966 and ran until 1969. The Hole in the Wall at the Beach Hotel - where Ginger Restaurant is today - was the regular meeting spot for after surf beers and a game of darts. Sunday arvo soccer was a big thing, with the Commodores fielding a team, as well as the lifesavers, and games used to go down at the Portuguese Club in Summerstrand. Leo recalls Pipe being much better back in the day - with it breaking regularly at the back of Pipe, not on the boils like it does today. Guys like Dave Young, Pip Kaufmann, Ant Foster, Wally Hayes, Viv Spindler, Keith Butler Wheelhouse and Stuart Hickson-Mahoney were the regular Pollock crew. 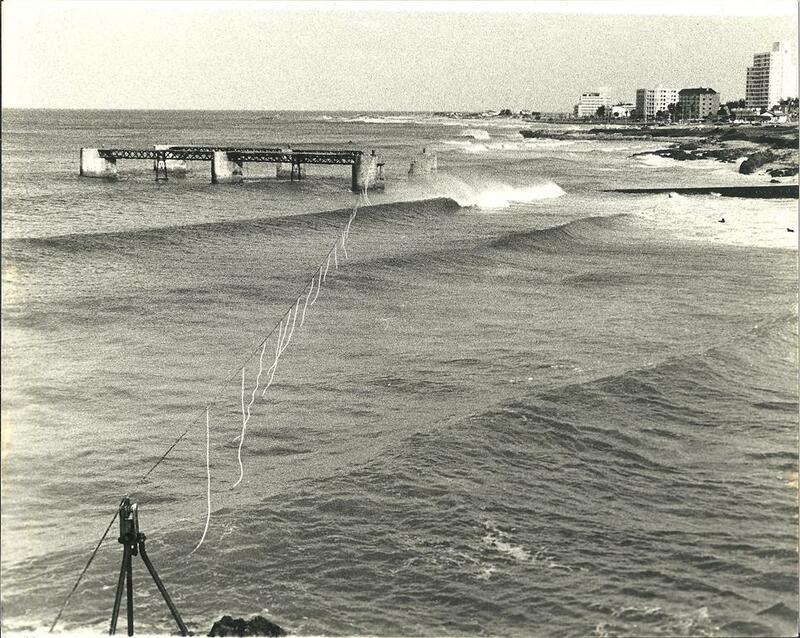 Rincon wasn't surfed much back then because it was before the leash - and a lost board meant a swim in over the rocks. For a similar reason Millers wasn't surfed that much at the start either. In about the 70's, when the short boards started making an appearance, local surfer Errol Heasley started to make "leashes". They were basically surgical tubing with some cord threaded through the middle of it, which had a rugby sock at one end which you tied around your ankle, and the other end you tied to a hole you made in your fin. 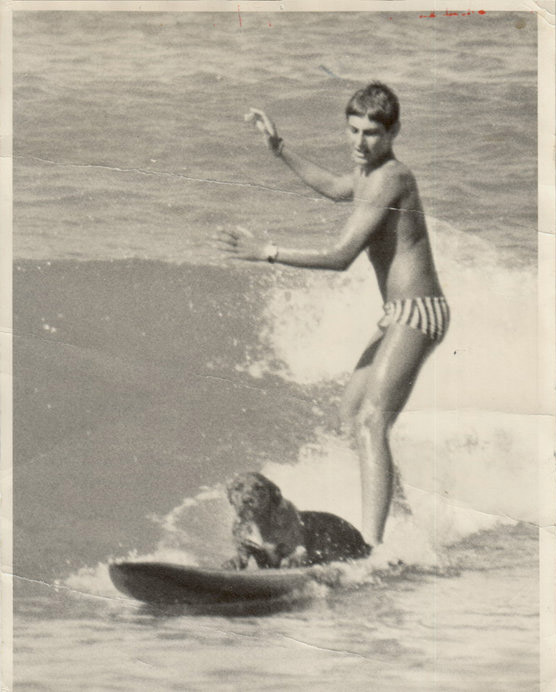 Rick Field and his dog Simba at Pipe in 1967. Check out the waterproof watch! 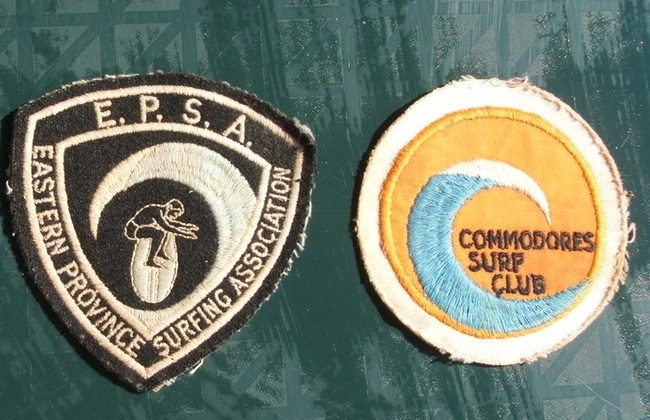 So there you have it - PE's surfing history - and how a bunch of lifesavers established the surf scene here, and got the first surfboard label off the ground. We're forever grateful guys!